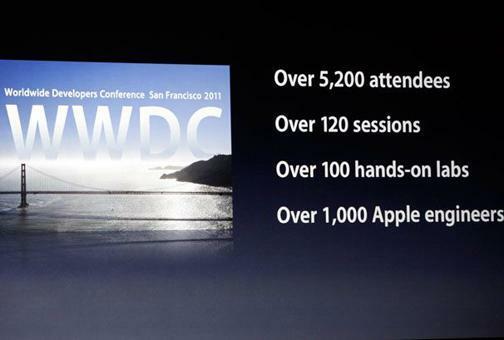 Apple's Keynote address at WWDC 2011 covered Lion, iOS 5, and iCloud. Here are some images from Monday's two-hour event. 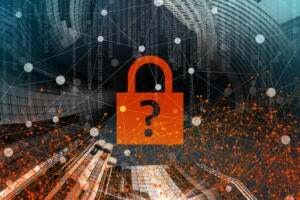 Apple kicked off the 2011 Worldwide Developers Conference (WWDC) in San Francisco with a keynote address, which previewed some of the new features in iOS 5 and OS X 10.7, Lion. Macworld was on hand, live blogging the event and taking photos. Here's a visual peek at what was covered. 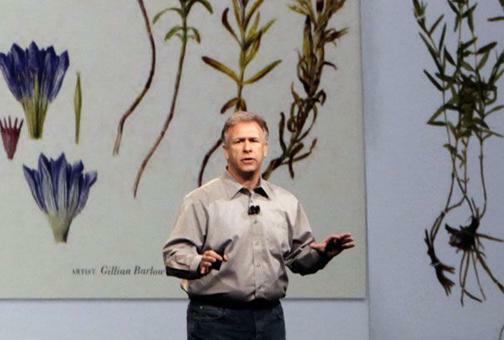 Steve Jobs kicked-off the event, but quickly turned presenting duties over to Phil Schiller, Apple's senior vice president of worldwide product marketing. Craig Federighi, Apple's vice president of Mac software engineering, modeled for the new full-screen version of OS X's Photo Booth. Photo Booth is also adding new effects and face detection. The new Auto Save and Versions features in Lion save your work every five minutes or whenever you pause. If you want to return to an earlier version of a document, you can select Revert to Last Opened and start fresh. The AirDrop feature in Lion, located under Favorites in the Finder navigation menu, makes it easy to move files between computers. When you select AirDrop, it automatically detects other AirDrop-compatible computers within 30-feet. 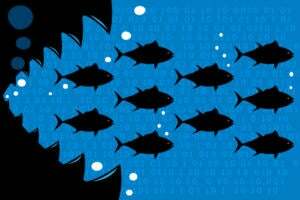 Drag and drop any file onto someone's name and it will transfer to their computer. Mail gets a some great new features in Lion, including the favorites bar, expanded message snippets, and messages grouped by conversation. The favorites bar looks like Safari's bookmarks bar and shows whatever folders you choose, along with the unread count for those folders. On the left, each message shows the name of the sender, subject line, date, and a two line preview of the message. The Conversations feature shows an e-mail thread as a full feed, suppressing any duplicate quoted text. 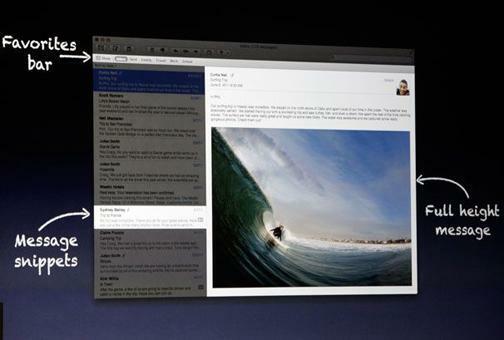 An at-a-glance look at some of Lion's many new features. Lion will be available in the Mac App Store in July for $30. 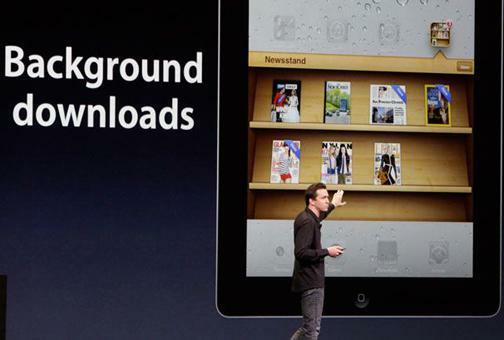 The Newsstand folder in iOS 5 collects all the newspaper and periodical apps you subscribe to in one spot. An alert badge on the folder will let you know when there's new reading material, and the icon for each app will reflect the latest cover from that publication. Taking a cue from tools like Instapaper , Safari in iOS 5 has a new Reading List feature that allows you to save articles to read later. The new Reminders app in iOS 5 is a to-do list that takes advantage of location based information. If you add a location to a task, it will remind you when you arrive or leave that place. It can sync up with iCal, Outlook, and other iOS devices. 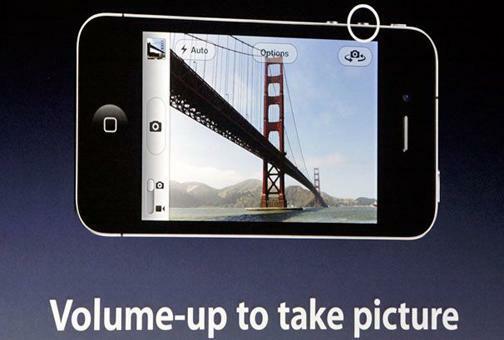 At last, iPhone photographers will be able to trigger the camera using the volume button. iPhone, iPad, and iPod touch users will no longer need a PC to activate their device. With iOS 5, these devices can be set-up and used without ever connecting to a computer. Seen here is the new welcome screen new users will see instead of the connect to iTunes screen. An at-a-glance look at all of iOS 5's new features. 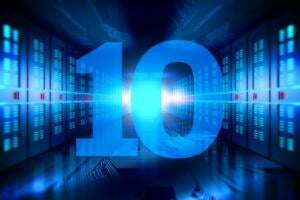 Learn more about iOS 5 here . Steve Jobs returned to the stage to introduce iCloud , Apple's new wireless data syncing service for iOS devices and computers. The Photo Stream feature in iCloud automatically syncs the pictures you take with your iOS device with other iOS devices, iPhoto on your Mac, your Apple TV, and the Pictures library on a PC. 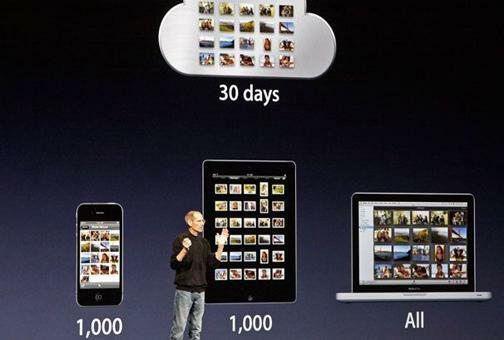 Steve Jobs stands in-front of a chart comparing iTunes in iCloud with similar, existing services. A look inside Apple's third data center in North Carolina, which Jobs described as rather large and as eco-friendly as possible.